This is the amusing story of a city - yes, an entire city - fighting to retain its honour and reputation in the face of the bleak forecast of its future made by a major national magazine. On January 21, 2011, Newsweek published an article entitled "America's Dying Cities". Noting that in the first decade of this new millennium the U.S. population had its smallest rate of growth of any time since the Great Depression and labelling it another sign of the financial woes of the country, Newsweek set out to find out which metropolitan areas with a population exceeding 100,000 suffered the steepest population decline in the same period. In looking ahead to the future of these regions, the magazine looked at the drop of those under the age of 18 as an indication of an even greater decline in these areas due to a lack of young people. The article consisted of the 10 cities with the steepest drop in overall population and the largest decline in the number of residents under the age of 18.
down 9.7 percent; youth off 3.1 points. down 26.8 percent; youth off 5.1 points. MLive.Com, a online web site representing various Michigan newspapers, fired back with an article on January 21, 2011 listing various good things happening in Grand Rapids which indicate anything but a dying city. Three out of the ten cities are in Michigan and yes, the state has had more than its fair share of the financial pain due for the most part to the decline in the auto industry. Okay, this seems kind of glum. The beginning of the end? Well, it seems that one of the above ten cities decided to not take this lying down and carefully planned out a rebuttal that is now is the process of going viral on YouTube. Grand Rapids and local sponsors came up with approximately $40,000 to pay for the production of a video highlighting the good points of the city and advertise that the city was not dying but very much alive. Produced and directed by promoter Rob Bliss, the video features a tour of the downtown, crossing the Pearl Street bridge and ending at the Gerald R. Ford Museum. Various locals are out dancing and lip syncing to the song American Pie by Don McLean and the effort is being billed as the largest professionally produced lip dub in the world. 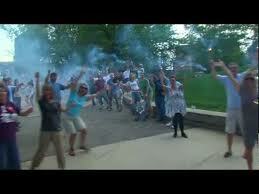 - A lip dub is a type of music video that combines lip synching and audio dubbing. - The project's overall goal was to paint Grand Rapids in a good light and with the video nearly a million hits on YouTube; people from all over the world are now hearing about Grand Rapids, Michigan. The single shot 10 minute video features more than 3,000 people with marching bands, dancers, weddings, and motorcades. Local news reported that the video featured familiar faces, including entertainers, political figures, media celebrities surrounded by hundreds of football players, musicians, cheerleaders, police and firefighters, swing dancers, kayakers and more, adding that many of the faces probably aren't familiar unless you're familiar with Grand Rapids. As we noted in the original piece, because the numbers are based on a 10-year period, they may not always paint the most up-to-date picture. New Orleans, for example (spoiler alert), ranked as the #1 dying city, due to the number of residents who were forced to move away after Hurricane Katrina struck in 2005, yet the city’s population has actually begun to grow again in recent years. Since the total population is still far below what it was in 2000, it tops the list. That said, we stand firmly behind the methodology used in this study and believe it provides a valuable glimpse at population and demographic changes throughout the country. The results were in no way intended to pass judgment on the people or the quality of life in each of these cities. Newsweek may be distancing itself from Mainstreet.Com but Mainstreet stands by its article. However, I think Mainstreet hit the nail on the head in saying that numbers are one thing, but with a little gumption, one can beat the odds. Britain's Daily Mail has an article on the Lip Dub video. Gawker's article is amusing entitled "‘Dying’ Michigan City to Newsweek: Drop Dead" and the Hollywood Gossip says "Grand Rapids, Michigan to Newsweek: Rank This!". In Salon's article "Grand Rapids' lip dub versus Newsweek", the author Drew Grant raises the interesting question as to why would Newsweek publish an article it didn't agree with. If the article is published, wouldn't anybody assume that Newsweek's editorial approved it? Should publications like Newsweek post articles from other publications "not endorsed" by the editorial team? Or do different ethical guidelines apply for the Internet content of a magazine than for its print version? Hey, Newsweek, if you don't agree with an article, don't publish it. Oh, and one other thing. Don't mess with Grand Rapids, Michigan!!! A lip dub is a type of video that combines lip synching and audio dubbing to make a music video. It is made by filming individuals or a group of people lip synching while listening to a song or any recorded audio then dubbing over it in post editing with the original audio of the song. There is often some form of mobile audio device used such as an MP3 players. Often they look like simple music videos, although many involve a lot of preparation and production. Lip dubs can be done in a single unedited shot that often travels through different rooms and situations within a building. They have become popular with the advent of mass participatory video content sites like YouTube. Grand Rapids is a city in the U.S. state of Michigan. The city is located on the Grand River about 40 miles east of Lake Michigan. As of the 2010 census, the city population was 188,040. In 2010, the Grand Rapids metropolitan area had a population of 774,160 and a Combined Statistical Area, Grand Rapids-Muskegon-Holland, population of 1,321,557. Thanks to Annie Parker (Twitter:@bitterdivorcee) for pointing this out.